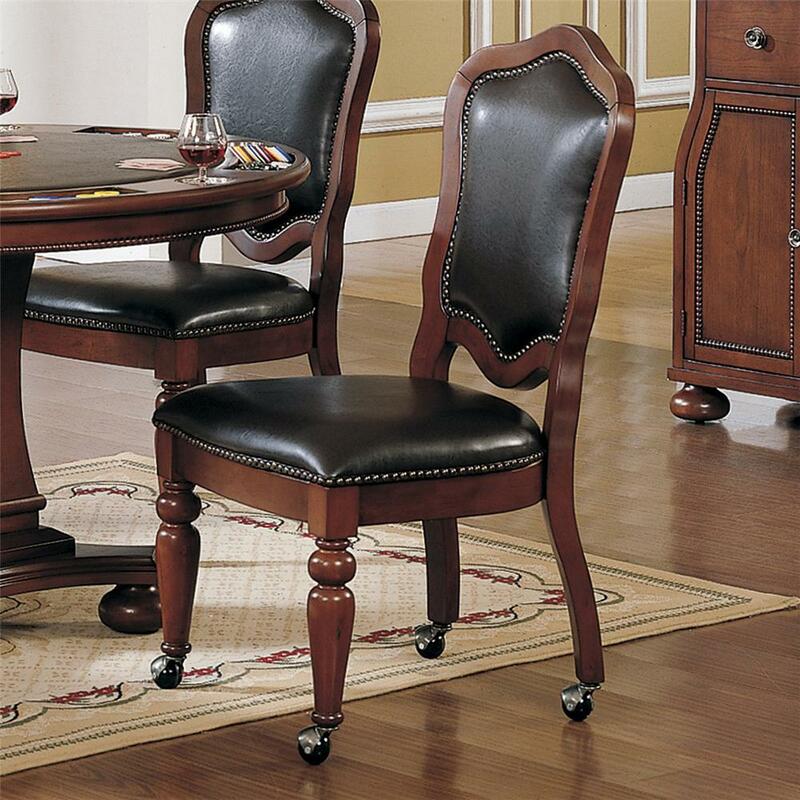 Revamp your dining area with the dining caster chair. 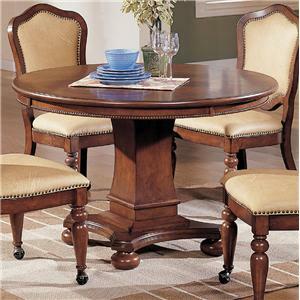 Classic curvature, warmly finished wood, and functional casters make the dining chair both functional as well as stylish. Nailhead trim and a cream upholstery complete the piece. The Timber Lane - Faran Brown Cherry Finish/Cordovan Vinyl Caster Chair by Cramco, Inc at Value City Furniture in the New Jersey, NJ, Staten Island, Hoboken area. Product availability may vary. Contact us for the most current availability on this product. Finish All tables are finished in a warm Cherry brown. 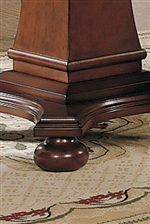 Finish & Paint Options All pieces are finished in a warm brown Cherry finish. Fabric Content Has nailhead trim. 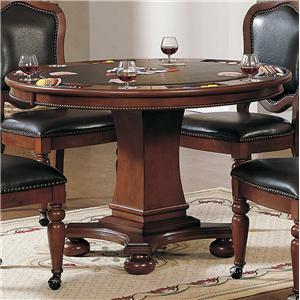 Play poker in style with the Faran game table collection. 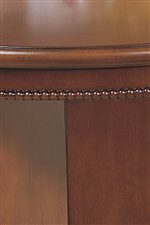 Grandly scaled, the collection features sculptural curves and contrasting nailhead trim. 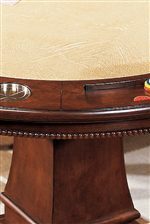 Flip the game table's top to go from game time to dinner party. 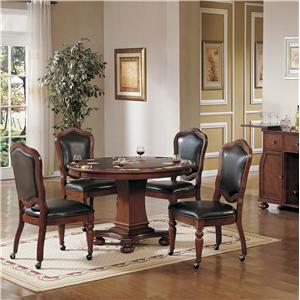 Its warm brown finish is inviting, while your choice of black vinyl or cream upholstery allows you to choose how formal your dining room is. 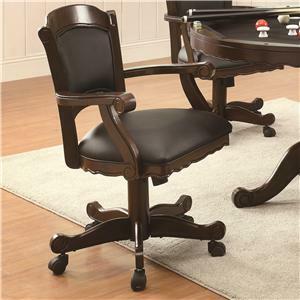 Casters on the side dining chairs allows you to easily add or remove chairs according to your purpose for the night. Timber Lane utilizes natures best hardwoods from the four corners of the world to craft the fine wood casual dining collections. Select solid hardwoods and veneers are meticulously carved and inlaid in our state of the art manufacturing facilities to reveal the richness of the unique designs. Timber Lane offers the quality you desire and the style to complement any decor. 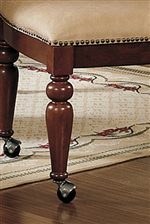 The Timber Lane - Faran collection is a great option if you are looking for Traditional furniture in the New Jersey, NJ, Staten Island, Hoboken area. Browse other items in the Timber Lane - Faran collection from Value City Furniture in the New Jersey, NJ, Staten Island, Hoboken area.